Products Finishing did an article on the success story by the Kremlin Rexson distributor, EAH Equipment (Austin, TX). Loadcraft switches to new paint system for drilling rigs. When part-time oilman Terry McIver went to Brady, TX in 2004 to buy a used drilling rig, he was surprised to find the company he was visiting was going bankrupt. Brady left with the oil rig, but a few months later he went back and bought the company. Loadcraft builds and paints trailers and rigs that must have a durable coat in often harsh weather conditions. When part-time oilman Terry McIver went to Brady, TX in 2004 to buy a used drilling rig, he was surprised to find the company he was visiting was going bankrupt and had just two employees left from over 200 it had a year earlier. Brady left with the oil rig, but a few months later he went back and bought the company. Today, Loadcraft is booming as it designs and manufactures trailers and drilling rigs, some of which can cost $9 million. But with a watchful eye on the economy and the mood swings of the oil industry, Loadcraft’s manufacturing department sought a better, more economical way to paint its trailers and rigs than what they had been doing. For example, they were using a zinc rich epoxy primer and a urethane topcoat on its mobile drilling rigs, but often saw much of the paint go to waste because of the hand mixing. Loadcraft had been using an airless spray system, but after examining several different options settled on Kremlin Rexson Cyclomix system (manufactured by EXEL North America) that automatically mixes the paint and reduces excess waste. EXEL North America rep Tom Dean at EAH Equipment (Austin, TX) helped install a system for two spray booths for the primer and topcoat, as well as a dual gun management system for a pair of spray guns in each booth. Dean says the new set-up cuts down Loadcraft’s waste by more than 30%, and estimates the savings to the company at about $100,000 annually. The Kremlin Rexson Cyclomix Expert can manage up to 24 components (bases, catalysts, flushing solvents), and can handle mono, bi- or tri-component materials. The machine is programmed on a color screen with ratio/tolerance data assist management to monitor material consumptions. By properly handling the mix, Loadcraft also reduced its VOC output, Dean says. Loadcraft opted for automatic flush boxes which are located in the spraying area, close to the painter so that it enables the person to be hands free while system is flushing. Perry says having the system programmed to run according to designated specifications is a time saver, as well as a money saver. Loadcraft specializes in design and manufacturing of 250-2000 horsepower drilling and work over rigs, as well as trailers, dollies, beams, and multi-axle components to support the heavy haul and oilfield transportation industries. 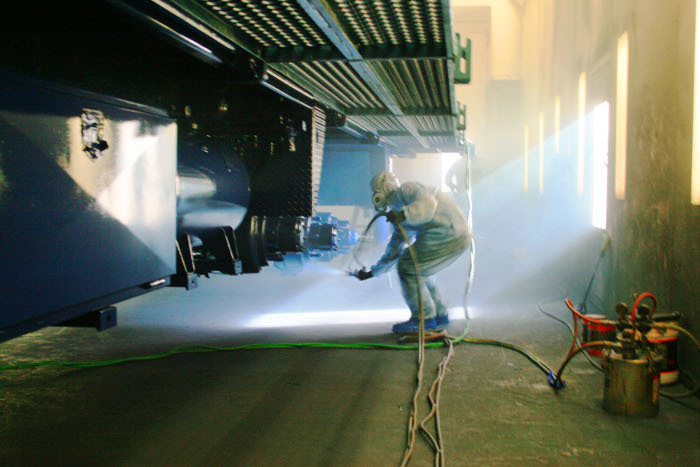 Since McIver brought the company out of bankruptcy, the facilities have expanded to include everything from a machine shop, three weld production lines, an on-site testing area, a vast warehouse and an indoor assembly area. The company’s equipment can be found anywhere from the San Juan Basin in New Mexico to the deserts of Oman. In the past several years, more than 130 rigs and close to 900 trailers have been shipped to Argentina, Columbia, Kuwait, Chad, Egypt, Turkey, Mexico, Libya, Venezuela, India, Ecuador, Russia, Turkmenistan, Belarus, Kazakhstan and Iran. That means the paint finish needs to last, especially in 130˚ heat in the Middle East. “We’ve had good results with the finish so far,” Perry says. Dean says he can see a better finish with his company’s Kremlin Rexson Airmix Atomization system than the old method Loadcraft was using with airless and conventional spray. Dean says the Airmix uses a specially designed aircap to provide a smooth and even finish.